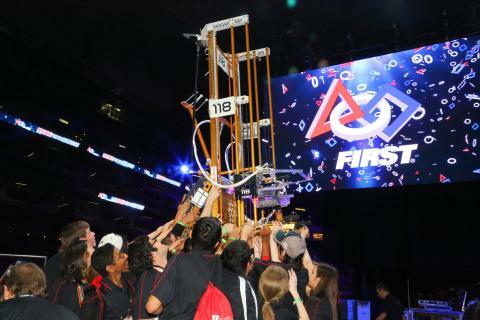 At more than 125 events around the world this season, alliances of robots are on a quest to win FIRST Stronghold, the 2016 FIRST® Robotics Competition game. FIRST was originally founded in 1989 by inventor Dean Kaman in order to transform our culture by creating a world where science and technology are celebrated and where young people dream of becoming science and technology leaders. Based in Manchester, NH, the not-for-profit charity designs accessible, innovative programs that motivate young people to pursue education and career opportunities in science, technology, engineering and math. Several age groups/grade levels comprise the various levels and types of competition, starting in kindergarten. The FIRST Robotics Competition gives high school students and their adult mentors the opportunity to work together to solve a common problem. They are given a standard kit of parts and a common set of rules, and challenged to design and build a robot—in just six short weeks!—to compete in a sophisticated field game. The robot "game" changes every season. This year, the game is FIRST Stronghold. For FIRST Stronghold, alliances of three robots are on a quest to breach their opponents' fortifications, weaken their castle with boulders, and capture their tower. For the first 15 seconds of the quest, the robots operate independently and points are scored by reaching the opponents' defenses, crossing defenses, and scoring boulders through goals in the opposing tower. Human drivers take control of the robots for the final 2 minutes and 15 seconds to defend their castle, retrieve boulders, defeat defenses, score goals from the opponents' courtyard, and capture and scale the opponents' tower. The alliance with the highest score at the end of the quest wins. This is the 25th season for the FIRST Robotics Competition. This year there are 3,128 teams competing from over 24 countries. That's over 75,000 students and 19,000 mentors! The final championship will be held April 27-30, 2016 in St. Louis, MO.